Every man and his dog. 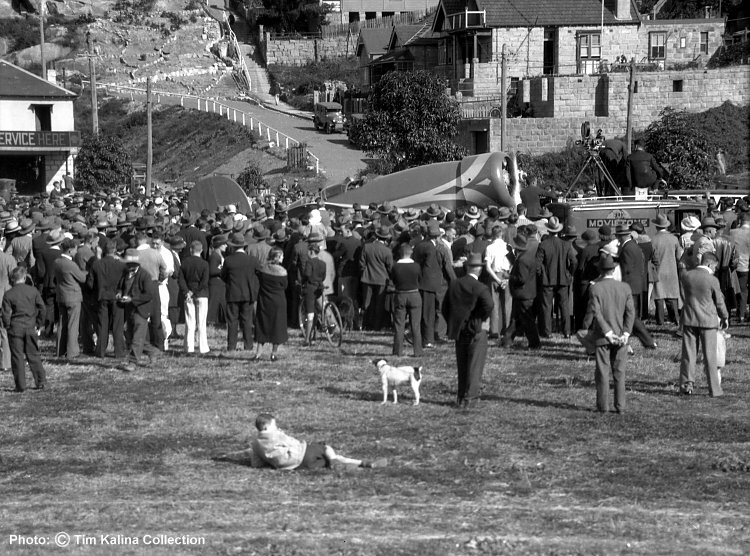 The Altair is ready for take-off from Anderson Park on 17 July 1934. Note the Movietone camera van to the right of the aircraft. The disinterest shown by the young lad in the foreground is noteworthy, given that the event for which the large crowd had waited was about to unfold. The photographer, Alan Evans, was associated with a company which had a very diverse presence in Australian industry. One of their clients was the Cockatoo Island Dockyards. From the early 1920s to the late 1950s, Evans recorded his working and personal life in thousands of expertly taken photographs. From the early 1930s, he used a Graflex camera. Some of his work was published in the Australian Photo Review and the Daily Telegraph. This collection of original Evans negatives depicts the July 1934 arrival in Sydney of the Lockheed Altair which was to become the "Lady Southern Cross". The collection was acquired by Tim Kalina in 2006.